Most people think they know all about the old lady who spilled McDonald's coffee on herself and sued the company for millions of dollars. Almost all of them are wrong. First of all, almost everyone has an inaccurate picture of the circumstances in which the coffee spilling occurred. Second, although a jury did award Stella Leibeck nearly 3 million dollars in damages for the incident, that amount was later reduced to $640,000. And if you think that's still a pretty easy way to may a few hundred thousand dollars, then you haven't seen the photographs of just what McDonald's coffee can do to a person when it spills on their lap. You'll see those photographs, and learn other details of the McDonald's coffee case and its effects on the American legal system, in Susan Saladoff's documentary HOT COFFEE. You'll see how what seemed like a loss for the huge fast food corporation and others like it was ultimately turned into a powerful weapon on their behalf, with outright distortions of the facts used to wage a campaign against “jackpot justice” and supposedly frivolous lawsuits. Because of that campaign, many states now have a deliberately slanted one-size-fits-all set of guidelines for civil lawsuits. As a result, those who are best able to make an assessment about what appropriate punishments should be, the judges and juries who actually hear the evidence, have their hands tied. The main way in which this is accomplished is through caps on damages. It's easy to frame this argument in a way that seems reasonable, but then you see cases like the one in this film in which a boy was rendered severely disabled for life because of medical malpractice. His parents sought, and won, an amount that would have provided care for their son for the rest of his life. Except the state they lived in, Nebraska, had caps on the amount of money that could be awarded in malpractice cases. So instead of the responsible parties paying for the disabled boy's care, it winds up falling upon the state (that means us regular taxpayers). 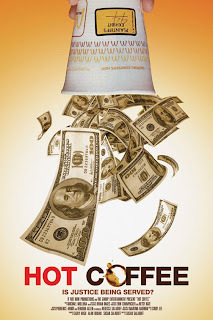 The film then goes on to show how corporate money has increasingly influenced judicial elections, and the way in which mandatory binding arbitration clauses in contracts have helped keep people from accessing the judicial system. I'll leave it to you to judge for yourselves whether Ms. Saladoff makes her case, but what I will offer my verdict on is the film itself. HOT COFFEE is quite well made considering Saladoff is a first-time filmmaker with no background in the field (she's an attorney by trade). As she says in the bonus features, she knew enough to surround herself with people who did know what they were doing, and it shows. HOT COFFEE flows smoothly, imparting considerable information without turning into a boring lecture. To what degree she can, Saladoff includes all sides of the issue, but not surprisingly there were some parties who refused to be interviewed. About the only complaint I have is that a couple of the deleted scenes, especially one that shows the correlation between health insurance rates and caps on malpractice damages, should have been in the film itself. 3 1/2 out of 4 stars.